The intent of Phase I initial impressions is to provide rapid support to the Warfighter. In parallel, these insights serve as part of a broader Ministerial-Level Advisor Training Effectiveness Study, which JCISFA will publish in the spring of 2011. These observations and insights may support planning and decision-making within the NTM-A/CSTC-A as well as joint, interagency, intergovernmental, multinational (JIIM) organizations responsible for force generation supporting the NTM-A/CSTC-A mission. Specifically, this report addresses contemporary issues and senior leader perspectives within the NTM-A/CSTC-A Ministerial-Level Advisor program to include prospective gaps across joint DOTMLPF-P domains. The following illustrates the NTM-A/CSTC-A mission. Senior level Advisors supporting the development of Afghan ministries provide critical roles in helping the United States and the Government of Afghanistan (GIRoA) achieve national objectives within Afghanistan. As a core function within the NTM-A/CSTC-A, senior Advisors support and influence capability development across two primary Afghan ministries: the Ministry of Defense (MoD) and the Ministry of Interior (MoI). Primarily, Afghan MoD and MoI provide an executive role and function in order to administer the Afghan National Army (ANA) and Afghan National Police (ANP) policy, recruiting, organizing, training, equipping, and building ANA and ANP capabilities. These capabilities provide the nation of Afghanistan with capacity to meet local and regional security requirements. In parallel, the Afghan MoD and MoI must influence and shape local and regional political decisions, plan and execute strategically, assess readiness levels, conduct reviews and analysis, as well as forecast and budget ANA/ANP fiscal requirements. These complex roles and functions within the Afghan ministries require skilled Senior Advisors capable of adapting culturally as well as operating functionally as subject matter experts (SME) within their respective ministry counterpart’s role and function. Within this framework, the JCISFA conducted Senior Advisor interviews and analysis across the NTM-A/CSTC-A in order to gauge senior Advisor capability requirements to support pre-deployment training and selection methodologies. Two sections provide organization for these initial impressions. The first deals with findings within Ministerial-Level Advisor Training. The second focuses on potential issues within Ministerial-Level Advisor Training. 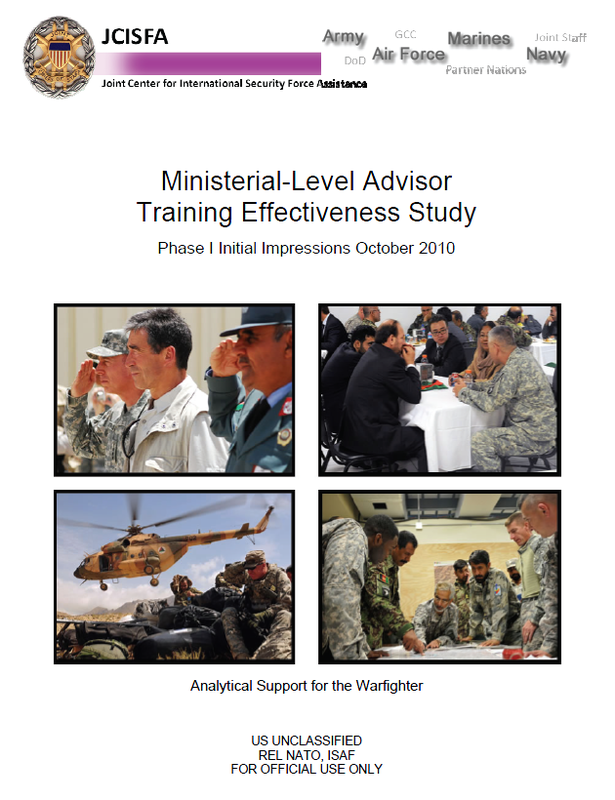 Interviews and surveys revealed that no formal pre-deployment training exists that prepares senior military officers to be Ministerial-Level Advisors. Interviews and surveys revealed that there is no standardized transition process between incoming and outgoing Ministerial-Level Advisors. There is no enduring capability to collect, analyze and integrate Ministerial advisor lessons learned in NTM-A/CSTC-A. A majority of the advisors interviewed/surveyed felt that the recent integration of support staff functions into the DCOMs has been a valuable first step towards improving Ministerial development capability. Personnel coming into theater and performing primary or additional duties as advisors are not receiving requisite advisor skills training. Senior Advisors interviews focused on how Ministerial developmental goals are established and evaluated/assessed. Almost all advisors interviewed/surveyed stated that the NTM-A/CSTC-A Ministerial Development Plan (MDP) process has been an effective tool in establishing goals and coordinating efforts across multiple functional areas. Senior Advisors interviewed/surveyed expressed that coordinating, conducting and reconciling travel with their counterparts is an extremely difficult and frustrating process. Overall, the majority of Ministerial-Level Advisors interviewed/surveyed expressed support for the AFPAK Hands program. Many of those interviewed/surveyed had comments and recommendations on the types of skill sets required for Ministerial advisors and on how joint force providers should identify, assign, and track future advisors. A great deal of observations and insights were collected regarding the Afghans’ abilities to govern/sustain themselves and effectively deal with corruption.